A Captain in the 53rd Sikhs who was born in Putney, London. He saw active service during World War One in Mesopotamia and Palestine and won the Military Cross. After the war, he became Director of Scientific Research for the Special Operations Executive, a top-secret organisation tasked with conducting espionage, sabotage and reconnaissance during World War Two. His life has been researched by his son, Citizen Historian Professor Malyn Newitt. Born in Putney, London on 28 April 1894, Dudley Maurice Newitt was one of the seven children of Alice and Edward James Newitt. He was educated at Wandsworth Technical Institute before serving an apprenticeship at the Nobel Explosives Factory (founded by Alfred Nobel) in Ardeer, Scotland. While in Scotland, Newitt attended evening classes at the Royal Technical College in Glasgow, studying organic chemistry and geology. Newitt returned to London in 1912 to pursue a science degree at Wandsworth Technical Institute. Just before his final examinations, World War One broke out. Newitt immediately enlisted in the army as a private in the 5th Battalion of the East Surrey Regiment before being transferred to India at the of November 1914. He initially received a temporary commission with the 54th Sikhs (Frontier Force) and served at Fort Lockhart before receiving his final posting to the 53rd Sikhs. Newitt was sent with the regiment to Basra (in modern-day Iraq) in 1916 and took part in all the major battles around Sannaiyat. The loss of Kut, the intense heat, the shortage of provisions and the prevalence of fever, scurvy, cholera and jaundice, all tended to create despondency and a feeling of inferiority. The day temperatures fluctuate from 110 to 120 degrees but are normally tempered by the hot shamal wind blowing from the north west. In 1916, however, it made no appearance till July and there were constant dust storms which temporarily blotted out the sun and covered everything with a layer of fine sand. Casualties due to sickness rose to an average of 11,000 a month, medical supplies were short and, due to lack of transport, the evacuation of the sick was hindered. As we converged on Baghdad, the Turkish resistance stiffened and our advance slowed down...We scratched about in the sand amidst a hail of bullets, digging primitive fox holes. About this time we were issued with ‘tin hats’ – far too hot to wear continuously but supposedly to be worn in action. The very first time I wore mine, I was hit with a spent shrapnel bullet which knocked me flat but did not other harm. The city was finally captured on 11 March 1917. ...a series of ruins on the right bank of the Tigris which the Turks had turned into a strong defensive position. The attack started soon after dawn, the 53rd advancing on an extended front against heavy artillery and rifle fire. We were frequently brought to a halt whilst Turkish positions were shelled – and would then advance a few hundred yards and again wait on our barrage. The Battle of Istabulat was the last major battle of the Mesopotamian campaign and finally ended with the capture of 16 railway engines. Newitt, only 22 years old at this point, had been at the forefront of the campaign throughout. The main Turkish resistance was now broken and we advanced rapidly northwards, picking up large numbers of prisoners and vast quantities of stores and equipment. Some of our marches at this time were phenomenal. In one instance, we advanced over very difficult rocky tracks in 48 hours, and on another occasion we covered 270 miles in 40 days. Newitt’s final major action was at the Battle of Samaria where he was awarded the Military Cross for leading the attack and promoted to Captain. An armistice was called on 30 October 1918 with the Ottoman Empire effectively ending the campaign. Newitt advanced with the regiment into Lebanon and Syria before they demobilised in 1919. Newitt returned from the Middle-East in July 1919. He decided to continue with his education and applied to the Royal College of Science to study chemistry. The course was due to begin in October 1919 and, in the meantime, Newitt visited an old family friend, Madame Angelique Schaeffer, in Rouen, France. Here, he fell in love with her only daughter, Alix, and they married during that summer before returning to settle in London. Sadly, in 1923, Alix died while giving birth to a stillborn child at a hospital in Nice. Later, Newitt married again to Doris Garrod in 1933. They had a daughter, in 1938, and a son, Malyn, in 1940. In 1921, Newitt completed his degree in chemistry and went on to complete a PhD in chemical engineering at Imperial College, London in 1924. This was the start of a long and successful career, particularly in the chemical measurement of substances at high pressure, which led to a readership in high-pressure technology at Imperial College. When the Second World War broke out, this expertise proved to be invaluable. Newitt, while at Imperial College, was involved in projects relating to the war effort, including designing ‘incendiary bombs’ and ‘bomb clearance operations’ in Kensington. 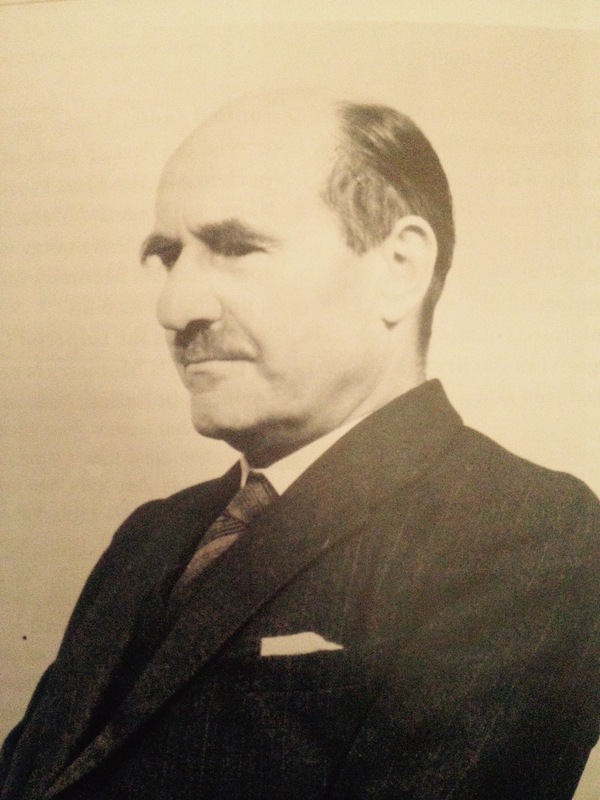 In 1941, at the age of 47, Newitt was asked to head the research wing of the Inter Services Research Bureau (ISRB) – a front for a new secret organisation, the Special Operations Executive (SOE). As Director, Newitt developed and provided explosive and technical support, including gadgets, for agents operating in enemy territory. Many have noted that Newitt was the real inspiration behind ‘Q’, the genius inventor in the James Bond series of books and film. See the article in ‘Other Links’ for more information about Newitt’s inventions. In 1945, at the end of World War Two, Newitt was appointed Professor of Chemical Engineering at Imperial College, the Head of Department in 1952 and Pro-Rector of the College in 1956 before his retirement in 1961. Newitt died on 14 March 1980 in Farnham, Surrey. Newitt’s son, Professor Malyn Newitt, has been writing a biography of his father using the memoirs and extensive archives that belonged to Captain Dudley Newitt. You can hear Malyn talking about his father in his Spoken History interview in 'Other Links' below.